Luol Deng was probably in my speculative trade scenarios more than any other Bulls player. Not because he wasn’t a talent, but as I often would tell Deng because he was and how much he might be worth and even be in a better position for himself. None of them obviously occurred. So then I began to hope with the injuries to Derrick Rose that the Bulls would keep Deng and still be able to put up a competitive fight in the depleted Eastern Conference. So, of course, late Monday the Bulls traded Deng to the Cleveland Cavaliers for the expiring contract of center Andrew Bynum, who will be released Tuesday, and draft picks, a possible Sacramento No. 1 and two Portland No. 2’s. It turned out the Bulls last week surreptitiously made a last ditch effort to resign Deng, a three-year offer, according to sources, for $30 million. Deng rejected that and understandably so. With a limited free agent market this summer, he has the chance to be one of the top free agents, a multiple All-Star who could get a deal at least as large as the one Andre Iguodala received last summer from Golden State, four years for $48 million, or Josh Smith $54 million for four years from Detroit. It’s hard to blame Deng for rejecting the offer. Yet, it’s also difficult to fault the Bulls, who were facing losing Deng for nothing if they allowed him to go to free agency at this point. And then if they paid him the $12 million to $15 million he figures to receive, it would, even with an amnesty of Carlos Boozer, severely limit the Bulls ability to make any offseason moves. They probably wouldn’t be able to make a substantial offer to European star Nikola Mirotic, who would stay in Europe, and be out of any consideration of other free agents. It seemed clear management’s decision once Rose was injured in November and lost for the season was this would be the last run for this group that came together in the summer of 2010. It probably would have been even if Rose were not injured. So now the decision is obvious as the team begins to move forward not only without Rose, but without its longest serving veteran and only other multiple All-Star in Deng, also the team’s top defensive player. Yes, the Cleveland Cavaliers are going for the playoffs and the Bulls appear headed to the lottery. No one’s made that observation for awhile. By taking on Bynum, who has a buyout of his $12.2 million contract effective Tuesday, the Bulls will release Bynum. He’ll probably end up with the Heat as the latest surprise addition or with the Clippers back in Los Angeles where he played for the Lakers and made the All-Star team. With luxury tax calculations, the Bulls will save about $21 million by the deal with the loss of the Deng contract and the release of Bynum. It doesn’t quite put the Bulls out of the luxury tax yet. But they should get there either with another trade or some maneuvering with 10-day contracts, which start this week. The significance is it gives the Bulls more breathing room to stay out of the penal repeater tax that penalizes a team for being in the luxury tax in any period of four times in five years. Thus the Bulls won’t have to worry about luxury tax implications and insiders say the team intends to plow the saved money back into basketball moves in free agency next summer. The No. 1 draft pick the Bulls were seeking is conditional, as much in the hope of getting a first round pick for Deng as the breakdown of talks and realization of getting something rather than losing him for nothing. The draft pick from the Cavs is the Kings No. 1 pick this season with 1 through 12 lottery protection. Given how poorly the Kings have done amidst continuing team dysfunction, there seems no chance the Bulls could get the pick this season. The pick then has declining lottery protection through 2017, like the Bulls pick from Charlotte. But unlike that Charlotte pick, after 2017 the pick becomes a second rounder. Thus the Bulls will root for the Kings to make the playoffs before 2017 or be the last team out. The Bulls also have a one year in 2015 right to swap places in the draft with the Cavaliers as long as the Cavs are not in the lottery. The Bulls also get Portland seconds from 2015 and 2016. Bulls executive John Paxson will meet with media Tuesday morning after team shootaround in the United Center to discuss the deal. Forman is at the D-League Showcase tournament in Nevada. Yes, begin the Carmelo Anthony talk. They’ll probably seep well into the summer and free agency. LeBron James and Dwyane Wade, who also have opt outs this summer? Been there, didn’t do that. But there were reports last week Knicks star Anthony might want to leave the Knicks this summer. With Deng off the books now and Boozer possible for an amnesty, the Bulls payroll is about $47 million for next season. That would give them only about $10 million in free agency, thus much too little money to go after a free agent like Anthony, who makes $21.4 million this season with raises coming. To get in competition for someone like Anthony, the Bulls would have to effectively give away Taj Gibson in a deal similar to the one with Deng, and probably Mike Dunleavy as well. That seems highly unlikely. Although the Bulls likely have no firm future plans at this point, it’s certainly possible given the circumstances and his value that they could trade Dunleavy, who makes $3.1 million this season and is on a two-year deal. For the Suns game Tuesday, it would appear the starting lineup with Boozer likely still out with a knee injury will be Kirk Hinrich, who is a free agent after this season, Jimmy Butler, Dunleavy at small forward, Gibson and Noah. Once Boozer returns, he would start with Gibson returning to the reserve sixth man role. Rookie Snell likely thus gets back in a more regular rotation with Deng traded and the Bulls perhaps bring back Marquis Teague from the D-League. The trade of Deng obviously weakens the Bulls playoff possibilities for this season, though not likely in the view of coach Tom Thibodeau and the remaining players. Given the uncertainty in the Eastern Conference and the limitations of the Bulls roster now, it would be questionable whether the team could make the playoffs. That would give the Bulls a potential lottery pick and then perhaps another at the bottom of the lottery if the Charlotte Bobcats make the playoffs or come close as the Bulls have their pick from the Tyrus Thomas deal lottery protected through 10 this season. That pick is protected through No. 8 in 2015 and then unprotected in 2016. Forget South Beach, the Bulls’ priorities are now Secaucus, where the NBA conducts the annual draft lottery. Unless the Bulls make any more major trades and remain perhaps $10 million under the salary cap, the likelihood appears they’d be able to make a better offer to enable Mirotic to come to the NBA next season. Mirotic has a buyout on his European contract for one more season and it was questionable whether if the Bulls could only offer the mid level exception it would make sense for him to come to the NBA next season. It probably would be better financially for him to wait another year until his European contract ended. But with the Deng trade, one possibility is the Bulls could offer Mirotic more money and have him come sign this summer instead of in 2015 and perhaps have something left for a lower level free agent. That, of course, is if there is an amnesty involving Boozer. So, obviously, there are more moving parts and plenty more to watch with the Bulls in the upcoming months. It should be a financially positive move for Deng assuming he likes Cleveland. The Cavs have a good, young core of players around point guard Kyrie Irving. They have been missing a small forward and a veteran. Thus the Cavs get an All-Star for a player they had decided to release in Bynum. 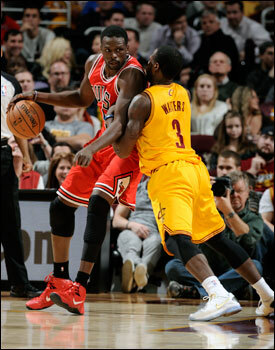 But it also now puts the Cavs in position to make a major offer to retain Deng. Plus, they can give him the most money. They’d probably offer him four years as they’d save their one five-year deal to extend Irving. But Deng would benefit from higher raises from the Cavs as opposed to going into free agency. Deng likely would want to test the market since he never has. And he said at this stage in his career at 29 in April he wants to be with a winning team. The Cavs could be that team. But Deng will be a free agent and if the Cavs want to so a sign and trade for… Nah. Don’t blame me, Lu. Though given Noah and Deng are close, it does appear Noah may finally be vacationing in Cleveland after all.